The flea is a small insect that has a reddish brown colour and measures about 2mm long with a lateral flattened body, which makes it easier for the flea to move within the host’s hair. The most noticeable features of fleas found cats and dogs, are their large legs that make it possible for them to jump. They also have a number of dark non-sensory spines on the frontal part of the head and in the rear segment. 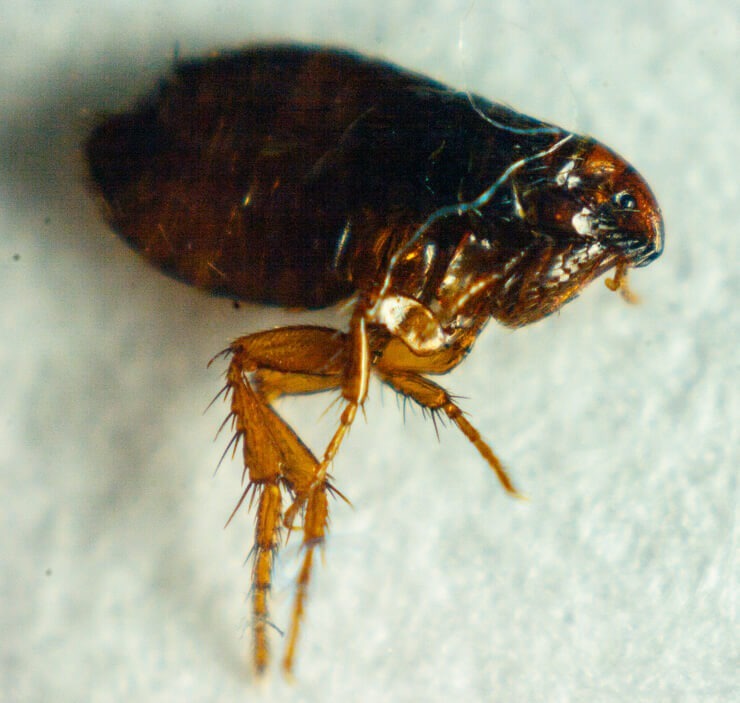 Fleas will not only bite you and cause intensely irritating itching, but they can also give you sleepless nights with the sensation caused by the tiny spikes on their feet. Although many people try over the counter products, they are often simply not effective enough, and in order to rid themselves of the problem for good they seek out professional providers for flea pest control. While fleas thrive on cats and dogs, fleas can also live on humans. If you spot even one of these little parasites on your pets, it is advisable to get pest control for fleas immediately, before the fleas breed and the problem escalates. Flea bites can cause distress to the host and they have been known to provide an intermediate home for tapeworms that grow in the digestive system of not only cats and dogs but also people. Children are more susceptible to tapeworms than adults. To keep your home safe, flea and pest control is needed to get rid of the infestation. We provide the most affordable and effective flea control London. Although, the term control is probably misleading in this situation, because the appropriate measures should be flea elimination or extermination. These are not the kind of pests that you want lingering around your home for long. The process for flea control in the home is quite intensive, as the infestation source, such as the host animal, must be identified and dealt with first. If the pet itself has become intensely infested, you may have to seek the services of a vet for your pet in addition to a pest control technician to deal with flea control in the house. Our professional flea control services involve applying residual insecticide to pet cages and beds, and spots that your pets like to sit on, such as rugs. However, this insecticide is pet-safe. Frequently, spraying the entire premises is necessary. If you need to get rid of fleas and require our services, contact us via email or phone and we will send our experienced flea pest control London team to your premises to conduct a thorough inspection. Our technician will advise you on whether you should contact your vet first (which is usually advisable) and then we will carry out the flea control service. Once the visit is over, our technicians will compile a thorough report, detailing the inspection and the flea control services and measures applied.